Vera Bradley has 4 classic colors now on sale for 60% off through Sunday, October 31st! Choose from Puccini, Mediterranean Blue, Mediterranean White and Night Owl. I have never liked the first 3 very much. 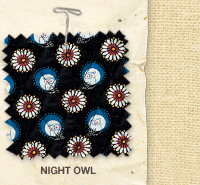 But I really like Night Owl. I have a Miller, Wristlet and Sunglass case in that color. I love the little owls, plus I really like polka dots and this is probably the closest it come to a polka dot print. Click here to check out the colors that are on sale.